DreamHost provides shell access to all of its customers, but it needs to be specifically enabled for each user added to your account. 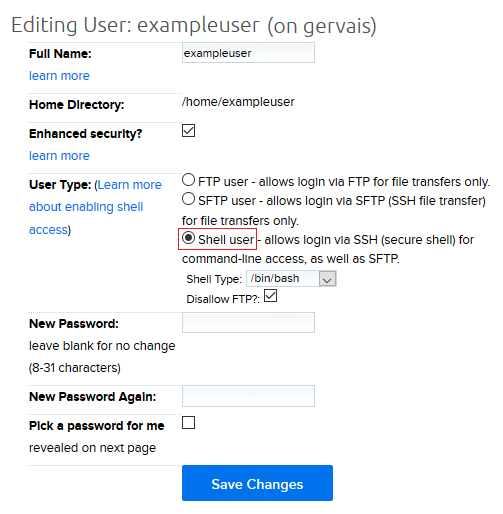 In this article, you'll find information on creating a new user with FTP/SFTP/Shell access and modifying an existing user to grant or remove FTP/SFTP/access. Visit the Manage Users page of the control panel. Click the Add A New User button at the top of the page. You’ll have three options for ‘Type of User Account’. Click the radio button for ‘Shell user - allows login via SSH'. You have a few options in this dropdown. It’s fine to just leave it as /bin/bash. Select the server you’d like to create this user on. Enter a name for this new SHELL user. You can just re-enter your SHELL username. Check this if you want the system to create a password for the user. Enter your custom password here if ‘Pick a password for me isn’t checked. When finished entering your settings, click the blue Add User button at the bottom. Keep in mind that it takes about 20 minutes for this change to take effect. 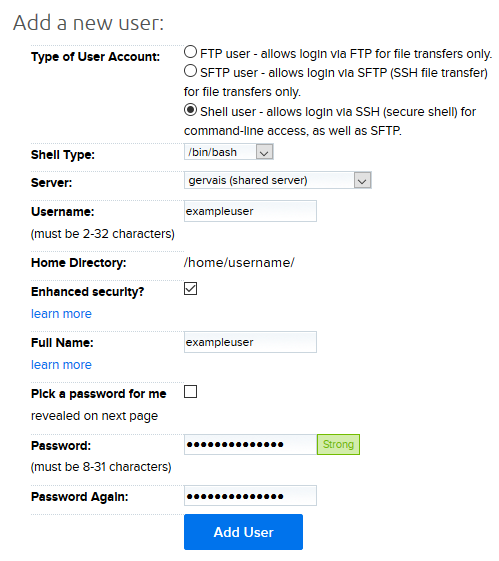 The following steps explain how to change an existing SFTP or FTP user into a SHELL user. Click the Edit button to the far right of the corresponding user. For the User Type, select ‘Shell user - allows login via SSH’. Shell access also provides SFTP access for the user. Unless the "Disallow FTP?" option is checked, it also provides FTP access to the user. Click the blue Save Changes button at the bottom to save the change.